Miss Snark, the literary agent: Agent referral "services"
Because I read your blog faithfully, never in a million years would I entertain the idea of mass e-mailing hundreds of agents at once with my query letter. However, a couple of authors on a discussion list I belong to say they received nearly instantaneous representation from reputable agents when they used the service publishersandagents.net In fact, not only did they land an agent within 48 hours, those agents actually sold their books. Are you familiar with this service (or others like it), and what is your snarkalicious opinion of it (them)? Did the people on the discussion board tell you the name of the book and the publisher? 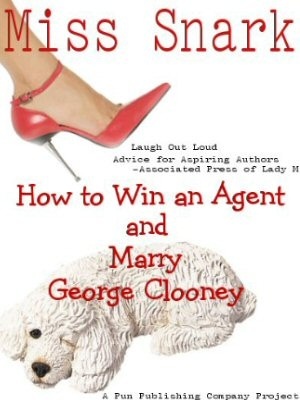 Let's assume for discussion that they did land an agent and sell a book. What we really need to know is how many other people tried this and didn't. If one person tries and succeeds, that's 100% success. If 10,000 people tried it and one succeeded ... not quite the success rate you're hoping for when you write the check for whatever amount they are going to ask you for. 2. They only know what we have taken on based on our descriptions. No one is looking at the actual writing-and it's the writing that counts. The only person who can tell you if I will be interested in your book is me. And I'll be glad to give you my opinion for 74cents. You mail me a letter; I'll mail you one back. Other agents are even less expensive if they take e-queries. You can find agent's emails, submission standards and recent sales on Publishers Marketplace for a grand total of $20 a month. Agent referral services are not altruistic. They are profit making ventures. I'd rather see you save your money for important things: Miss Snark's thank you gift, your ensemble for the Oscars, and ticket's to Killer Yapp's next joust with butterflies in Central Park. Postage goes up in January.